I spent a couple of hours around midday at the Houghton Bay stream today. With rain appearing imminent when I left I had expected a small catch, if any. By the time I arrived the sky had cleared considerably and I had a much higher catch than expected. Ended up with 49 birds of 8 species with 42 new and 7 recaps. From 11 to noon the rate was relatively slow with only about a dozen birds caught but in the next hour I was pretty well stretched. Song Thrush - 1 (0) a relatively rare species at this site. Silvereye - 17 (5) only 1 caught in first hour and then they arrived. Oldest was banded here at my place in 2013. Fantail - 1 (0) plenty about but as usual they danced in front of or flitted around the net. At the moment there are over 100 Yellowhammers feeding on the newly resown football field at Newtown Park. Last Thursday I attempted to catch some with very limited success. Since I last attempted this a couple of years ago there has been a great high fence built around the field. I am now unable to direct the birds towards the nets and had to rely on a pair of Magpies to herd the birds. In this they are quite good except they sent them in the wrong direction. Ended the morning with catching only 4 Yellowhammers plus a bonus catch of an Eastern Rosella. Our session at the Zoo on Saturday proved to be a busy one as we had near perfect conditions with full cloud cover and little wind. Fortunately we had a good team of experienced banders who were ably supported by enthusiastic younger folk. There wasn't a lot of variety in the catch with only 6 species and the total was dominated by 3 of the species. The catch of 172 with 145 new and 27 recaps was surprising as we had started half an hour later than usual and, due to the fact that we were catching mostly recaps already caught during the day, we knocked off an hour or so earlier. House Sparrow - 34 (7) all the recaps had been banded in the last 2 years. Silvereye - 84 (14) the big surprise of the day. A week ago there appeared to be very few in the area and it seems there has been a big influx in the last few days. This is probably the highest number of SE's we have caught in one day in May, with the highest numbers normally being in June/July. Of the recaps 5 were banded in 2013 and the oldest was banded in Feb 2009. It was originally banded in the Gully below my house (approx. 2 km) and had been recaptured twice at the Zoo in 2010. Ros, George and Annette extracting Silvereyes. I set the Funnel Trap here this morning as there appeared to be a few Silvereyes back in the area. There wasn't a big catch but it is the first significant number for the year. House Sparrow - 1 (0) a lot more about but most are trap shy. Silvereye - 8 (6) about a month earlier than last year. Two of the recaps, AP-13676 & 77 were banded together at Houghton Bay in March this year and caught together today. Another 2, AP-11878 & 79 were banded together here in July last year and caught again today. The oldest recap was banded July 2011. We had a session at the Karori Cemetery this morning catching 16 birds of 5 species. This was a bit below my expectations as we didn't catch any Tui which were the target species for today. 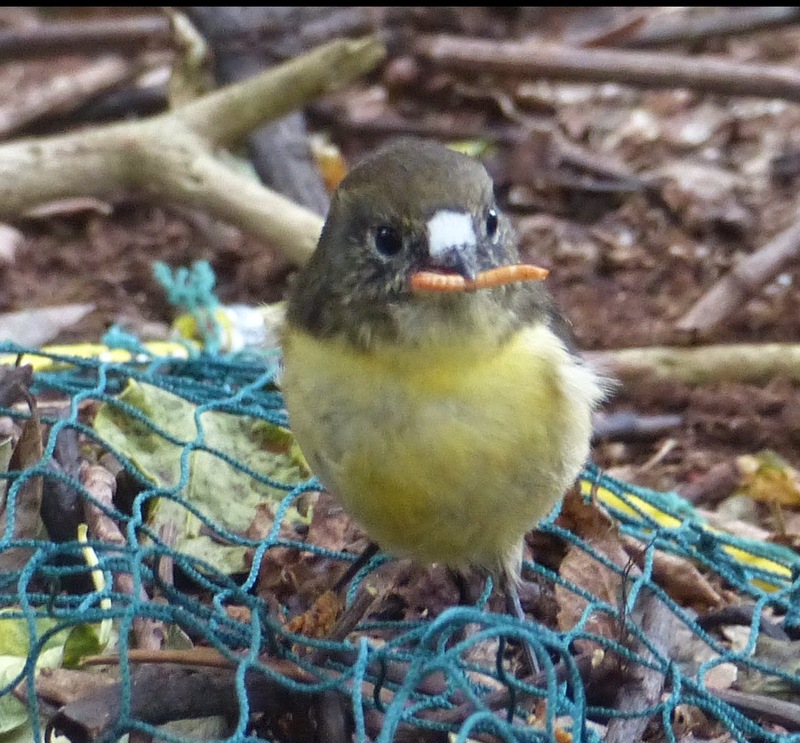 There were a lot of Tui about and we had several bounce and escape from nets when almost within grasp including a colour banded bird which was probably at least 5 years from banding. Unfortunately we were unable to get the complete combination. Blackbird - 9 (2) 1 recap was banded a year ago and the other 2 years ago. One of the female Blackbirds had very strong markings and in fact from a distance was mistaken for a Song Thrush. Annette and Tansy put nets up at the stream over the fence from the Zoo today. Tansy is a Ranger from the Chatham Is and is in Wellington for a series of meetings. She did banding/mist netting training with us a few years ago and took the opportunity to get in some more 'hands on' practice. As was expected for this late in the season birds were few in number but they did catch 7 of 4 species. 4 new Chaffinch, 1 new Silvereye and a new Kingfisher, the first caught at this particular net site. Also caught was a Fantail recap. This had been banded back in January at a little stream below my house and is one of very few Fantails recaptured away from its banding site. A couple of our group (Annette & Nikki)are back from the Chatham Islands, where they were helping with the Black Robin post-breeding census. The following post is from Annette. Departure was delayed several days while waiting for Cyclone Pam to pass over the islands and the sea to calm down. On arrival they found that there was little damage on Mangere Island, which had been largely protected from the full force of the wind and the seas by Pitt Island, but Rangatira had suffered significantly. Many huge old Chatham Island Ake Ake (Olearia traversii) had been blown over, and in some places this had set off a domino reaction, cutting a swathe of destruction through the bush. The destruction around the coast was equally dramatic, with immense carpets of muehlenbeckia rolled up on the rock platforms or torn away completely, and huge straps of bull kelp wound around trees tens of metres above the normal sea level. Not surprisingly, Shore Plover numbers were down by about 20%. The Robins had obviously been affected also as they were more warier and secretive than usual, and even reluctant to come down and eat mealworms. 259 adults were present at the start of the breeding season but only 222 of these were seen during this trip. Juvenile numbers were even further down, with 49 seen compared with the 75-80 seen the last two years at this time. However the extent of the losses will not be known until the start of the next breeding season, as the birds may still have been ‘spooked’ and reluctant to show themselves; and on the other hand the combined stress of a summer drought followed by the cyclone may cause higher than usual mortality over winter. Surprisingly, the smaller forest birds were plentiful. There were many Silvereyes, and more Fantails than I have ever seen, with groups of five to seven frequently present. Warblers flitted around busily and Tomtits were always ready to profit from the robins’ reluctance to eat the mealworms. One positive effect of the storm was that most of the canopy was defoliated and so it was much lighter in the bush. This made it much easier to read the colour bands, and also it seemed warmer as the sun was able to reach the forest floor. The contorted shapes of the trees show that the island has weathered such storms in the past and doubtless will face more in the future.